Chemical « Global Market Insights, Inc. The global packaging equipment market is projected to witness an accelerated growth rate over 2018-2024, primarily driven by the expanding F&B & pharma sectors. Having held a valuation of $38 billion in 2017, packaging equipment market thrives on the changing trends of the food industry that conceptualizes state-of-the-art packaging solutions depending on the shifting consumer preferences. The rising urbanization and improving living standards around the world with the rise in disposable incomes have conjointly led to a surge in the demand for ready-to-eat foods and subsequently, innovative packaging, thereby stimulating packaging equipment market growth. According to a report about the food packaging trends by the Packaging Machinery Manufacturers Institute (PMMI) – a trade association that is made up of over 800 North American manufacturers and suppliers, food and beverage would account for more than 55% of the projected share by 2019. The association’s report also estimates that the food packaging market in the U.S. alone would be worth over $31 billion by 2022, thereby reiterating the significance of the food industry in North America. It is rather overt that in the years to come, food & beverage companies will continue to expand their product portfolios as they jostle with each other to capitalize upon the growing middle-class populace and its disposable income. The rising competition is certain to act as a catalyst, prompting food & beverage companies to begin constructing new plants, thereby augmenting the regional packaging equipment market trends. As per estimates, in 2017, North America held more than 25% of the overall packaging equipment market share and is expected to grow at a robust pace in the years ahead. Being one of the technological nerve centers of the globe, packaging equipment manufacturers in North America have been working to incorporate advanced technologies in these devices so as to automate the components with intelligent features. Eventually, this would lead to lesser human intervention and enable a seamless integration of hardware and software, resulting in manufacturers developing highly accurate and efficient products. This in consequence, along with the rising economic growth of the region, are certain to augment the growth graph of North America packaging equipment market. Apart from the F&B applications, global packaging equipment market will be receiving a sizable boost from the pharmaceutical sector as well. 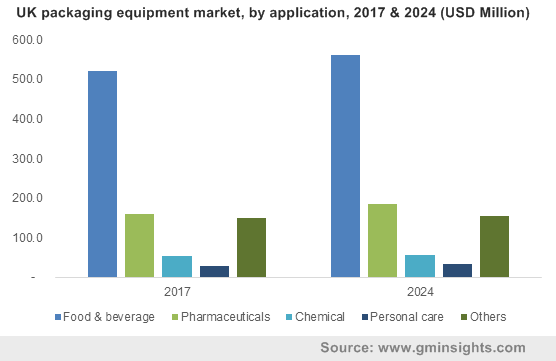 The inherent need for pharmaceutical companies to thoroughly and properly package their manufactured medical products to maintain the correct chemical composition will drive the packaging equipment market growth from pharmaceutical applications. The industry has also gradually been influenced by customer feedbacks that often request certain aesthetic features to be added to the medicine’s packaging to help distinguish them from other drugs. The growth of the pharmaceutical industry across APAC would prove to be one of the most viable driving forces for the regional packaging equipment market. The economies such as India, South Korea, China, and Japan have been increasingly shifting toward the adoption of smart solutions in manufacturing. Furthermore, the continent, as a whole, is driven by a strict regulatory landscape mandating pharma companies to adhere to certain rules, further augmenting the regional packaging equipment market. The accelerated growth of food, pharma, and numerous other end-use sectors is thus certain to impel the commercialization landscape of the overall packaging equipment industry. While North America will continue to remain one of the most lucrative hubs as far as packaging machinery is concerned, emerging economies across the Asia Pacific are also racing ahead in packaging equipment market. Powered by a strong global manufacturing sector and the subsequent demand for packaging devices, the overall packaging equipment market size is slated to register a CAGR of 3% over 2018-2024. This entry was posted in Sustainable & Smart Technologies and tagged Bottle Filling, Cappers, Capping, Chemical, Coding, FFS, Fillers, Food & Beverage, Form Fill Seal, Global Packaging Equipment Market, Hot Stamp, Ink Jet System, Labelling, Laser System, Liquid Type, Packaging Equipment Market, Packaging Equipment Market Report, Packaging Equipment Market Size, Palletizing, Personal Care, Pharmaceuticals, Powder Filling, Roll On Pilfer Proof, ROPP, Rotary Sticker, Screw Capping, Self-Adhesives, Thermal Transfer, Vial Coating, Wet Glue, Wet Ink System. A major sub-vertical of the specialty chemicals sphere, n-Hexyl alcohol market has established itself as a profitable business space owing to the ever-expanding personal care industry. Given how extensively the product is used across the production of soaps, shampoos, lotions, & creams, the growth of the personal care business is certain to have a highly appreciable impact on n-Hexyl alcohol industry trends. This directly proportional liaison is not confined to a limited set of regions but would be applicable across major geographies. Say for instance, VLCC recently launched a range of personal care and wellness products, the sales of which have been speculated to commendably impact India n-Hexyl alcohol market outlook. Besides being used as an antiseptic and preservative in cosmetics, n-Hexyl alcohol market has garnered considerable returns from the use of the chemical in modern packaging industry. Pharmaceutical packaging such as wrapping which includes capsules, tubes, bottles, vials, etc., has proved to be exponentially lucrative for the growth of this industry. Speaking of the pharmaceutical space and the use of wrapping materials, it is worthy to mention that N-Hexyl alcohol is also widely used as a plasticizer precursor for packaging. The product is used in the production of PVC – the basic material for many packaging substances that range from wrappings in the medicine industry to wrappers in the cosmetics sphere. The F&B sector has established itself as a vital application avenue for N-Hexyl alcohol market, essentially because of the chemical’s deployment in direct food contact packaging material such as food grade wraps and polymer films. Hexanol also finds widespread application as an emulsifying and preserving agent, with the rising demand of alcohol in food flavoring. Indeed, alcohol plays a huge role in the production of baked foods, ice-creams, gelatins and puddings, enlarging the scope of n-Hexyl alcohol market from the food industry. 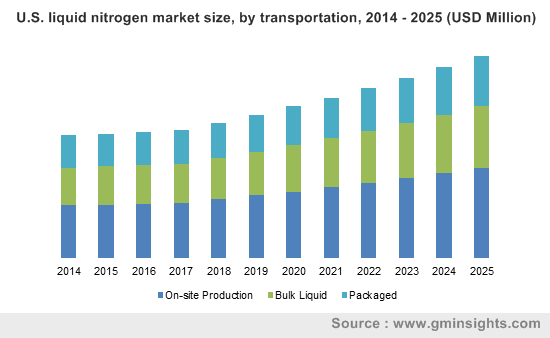 Besides the mainstream uses of hexanol, some unconventional uses of the chemical are also coming to attention that have the potential to augment the commercialization scope of n-Hexyl alcohol market, especially in relation to the current drive to achieve sustainability in fuels. An experiment to increase the sustainability of diesel through the addition of hexanol in ethanol diesel has shown that smoke emission can be significantly lowered by a blend of ethanol-hexanol diesel. The resultant blend apparently encompasses more oxygen content, while helping to improve engine performance as well. The rising levels of nitrogen oxide in urban areas, depletion of petroleum reserves, and smoke emission from diesel engines have led to research programs being conducted to find sustainable fuel for the automotive industry. The blend fuel method, that requires no changes to the diesel engine while effectively combating the problem of GHG emissions, has emerged as a clearly superior method. Quite overtly, the mainstream use of this methodology is certain to revolutionize n-Hexyl alcohol market trends in the ensuing years. The availability of chemicals that can potentially substitute hexanol like N-decanol, N-octanol, N-undecanol, N-nonanol, etc., can pose as a major threat to the growth of n-Hexyl alcohol market. However, the chemical’s deployment across personal care products is so tremendously vast that the commercialization scope of this industry is certain to expand in the ensuing years. 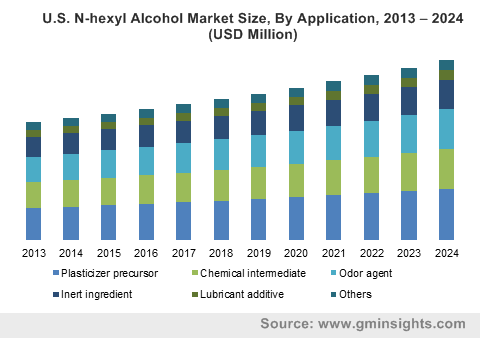 The expansion of the personal care space across the economies of India, China, South Korea and Japan would also significantly impact the overall n-Hexyl alcohol market growth. According to estimates, n-Hexyl alcohol industry size will register a CAGR of 4% over 2017-2024, further strengthening its stance in the billion-dollar business sphere. This entry was posted in Bulk & Specialty Chemicals and tagged Chemical, Chemical Intermediate, Food & Beverage, Inert Ingredient, Lubricant Additive, N-Hexyl Alcohol Market, N-Hexyl Alcohol Market Analysis, N-Hexyl Alcohol Market Report, N-Hexyl Alcohol Market Research, N-Hexyl Alcohol Market Size, Odor Agent, Personal Care, Pharmaceuticals, Plasticizer Precursor. Harmful toxic gas emissions which has been a major concern in the chemical sector for years, now can be addressed with the adoption of flow chemical processes as these involve least heat exchange and consequently offers better reaction productivity. In response to this fact, chemical manufacturing units are emerging as one of the prominent revenue contributors of the flow chemistry industry. Pharmaceutical sector is further adding to a huge share of the flow chemistry industry. The report estimates that this sector will be the fastest-growing segment in the end-use landscape. Rising preference of flow chemistry products over batch reactors driven by safety parameters, usage in drug manufacturing, and ability to increase the production rate at a lower cost are the factors driving the flow chemistry market size in pharmaceutical applications. Petrochemical and chemical industry is also witnessing a huge adoption of flow chemistry products. In this regard, continuous stirred tank reactor has gained a significant prominence in the flow chemistry industry having dominated the flow chemistry product landscape in 2015. The huge demand for these products is driven by their ability to substantially increase the productivity with a parallel reduction in the cost. Academic & Industrial research units are also driving the industry share lucratively. The most common product deployed across these units are Microreactor systems, which possess superior heat and mass transfer properties, thereby regulating the heat during chemical reactions. 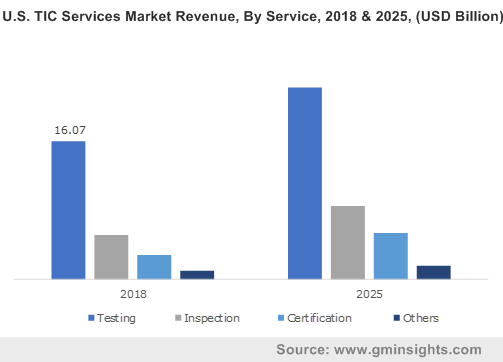 As per the estimates, Microreactor systems flow chemistry market is projected to witness highest gains at 15% over the coming seven years. In 2015, Asia Pacific led the regional race and dominated the global flow chemistry industry landscape. The growth path ahead looks strong for APAC with the shifting focus of the manufacturers to establish manufacturing units in this region, driven by its low initial investment and promising government backing. India and China will be the major revenue pockets for APAC over the coming timeframe, backed by the large manufacturing base across these countries. 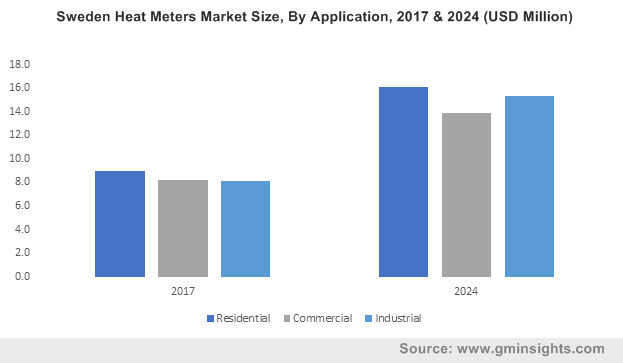 The commercialization of flow chemistry products is one of the major roadblocks for this industry growth as it requires heavy capital investments and advanced equipment. However, with the current developments in the market such as collaboration of manufacturers with the petrochemical, pharmaceutical, and chemical MNCs will combat the growth restraints. 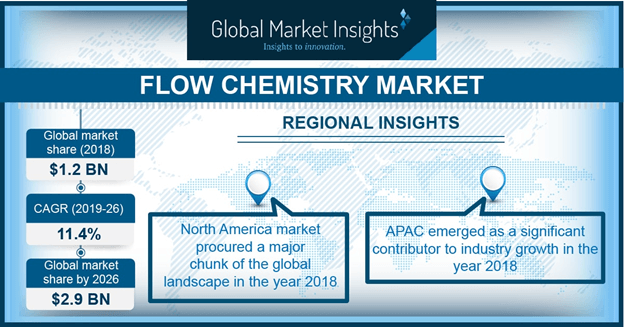 Flow chemistry market is consolidated with the major giants sharing more than 40% of the business space. However, the company is still competitive and is governed by the major differentiation parameters of pricing and technological advances. Key flow chemistry industry participants include Uniqsis Ltd, Koninklijke DSM N.V. FutureChemistry Holding BV, ThalesNano, AM Technology, Vapourtec Ltd, Chemtrix B.V., and Milestone Srl. This entry was posted in Sustainable & Smart Technologies and tagged Academic & Industrial Research, Chemical, Continuous Stirred Tank Reactor, CSTR, Flow Chemistry Market, Flow Chemistry Market Analysis, Flow Chemistry Market Size, Microreactor Systems, Petrochemical, PFR, Pharmaceutical, Plug Flow Reactor.